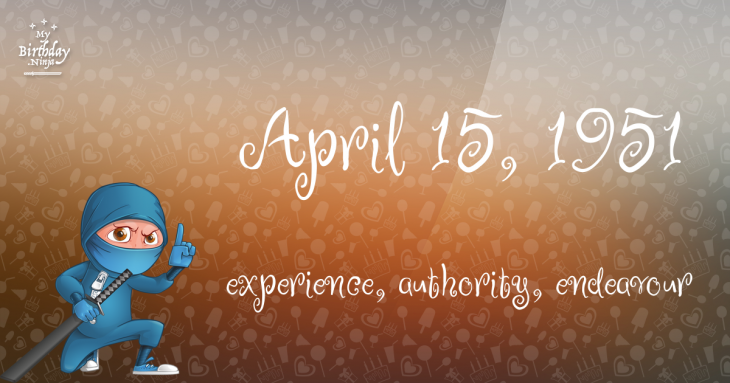 Here are some snazzy birthday facts about 15th of April 1951 that no one tells you about. Don’t wait a minute longer and jump in using the content links below. Average read time of 10 minutes. Enjoy! What day was my birthday Apr 15, 1951? April 15, 1951 was a Sunday and it was the 105th day of the year 1951. It was the 15th Sunday of that year. The next time you can reuse your old 1951 calendar will be in 2029. Both calendars will be exactly the same! This is assuming you are not interested in the dates for Easter and other irregular holidays that are based on a lunisolar calendar. There are 361 days left before your next birthday. You will be 69 years old when that day comes. There have been 24,842 days from the day you were born up to today. If you’ve been sleeping 8 hours daily since birth, then you have slept a total of 8,281 days or 22.67 years. You spent 33% of your life sleeping. Since night and day always follow each other, there were precisely 842 full moons after you were born up to this day. How many of them did you see? The next full moon that you can see will be on May 18 at 21:13:00 GMT – Saturday. Fun stat: Your first one billion seconds (1,000,000,000) happened sometime on December 22, 1982. If a dog named Mimpsy - a Cane Corso breed, was born on the same date as you then it will be 361 dog years old today. A dog’s first human year is equal to 15 dog years. Dogs age differently depending on breed and size. When you reach the age of 6 Mimpsy will be 45 dog years old. From that point forward a large-sized dog like Mimpsy will age 5-6 dog years for every human year. Bari, the last Byzantine possession in southern Italy, is surrendered to Robert Guiscard. Thomas Hopkins Gallaudet and Laurent Clerc founded the American School for the Deaf, the first American school for deaf students, in Hartford, Connecticut. Philippine–American War: Filipino guerrillas launch a surprise attack on U.S. infantry and begin a four-day siege of Catubig, Philippines. Black Friday: Mine owners announce more wage and price cuts, leading to the threat of a strike all across England. First day of the Arab revolt in Mandatory Palestine. The EC-121 shootdown incident: North Korea shoots down a United States Navy aircraft over the Sea of Japan, killing all 31 on board. Curious about this Stawberry Cream Cake? This is a party item you can activate and send to your friends when you play the free game Jump Birthday Party. It’s a fun and easy-to-play mobile game for all ages. Get free 1,000 gold coins when you download today! What does my birthday April 15, 1951 mean? 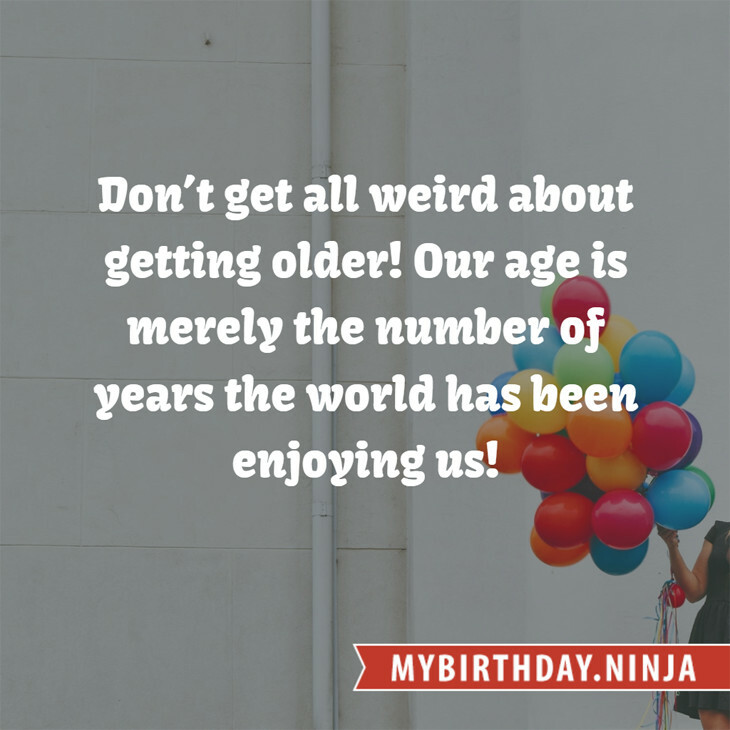 Your birthday numbers 4, 15, and 1951 reveal that your Life Path number is 8. It represents experience, authority and endeavour. You are gifted with natural leadership and the capacity to accumulate great wealth. The following celebrities also have the same life path number: Marcello Mastroianni, Danny Woodburn, J. Michael Hagopian, Gareth Hunt, Plan B, Sean Whalen, Carlo Aquino, Emraan Hashmi, Lee Joon, Mandisa. What is the birthday horoscope for Apr 15, 1951? The Western zodiac or sun sign of a person born on April 15 is Aries ♈ (The Ram) – a cardinal sign with Fire as Western element. The ruling planet is Mars – the planet of war and ambition. According to the ancient art of Chinese astrology (or Eastern zodiac), Rabbit is the mythical animal and Metal is the Eastern element of a person born on April 15, 1951. Fun fact: The birth flower for 15th April 1951 is Sweet Pea for love. What is the Love Match for Apr 15, 1951? When it comes to love and relationship, you are most compatible with a person born on November 19, 1971. You have a Love Match compatibility score of +104. Imagine being in love with your soul mate. On the negative side, you are most incompatible with a person born on August 5, 1947. Your incompatibility score is -119. You’ll be like a cat and a dog on a love-hate relationship. Arf-arf, I want to bite you. Meow-meow, stay away from me! How many babies were born on April 15, 1951? Base on the data published by the United Nations Population Division, an estimated 97,382,033 babies were born throughout the world in the year 1951. The estimated number of babies born on 15th April 1951 is 266,800. That’s equivalent to 185 babies every minute. Try to imagine if all of them are crying at the same time. What is the popular baby name on 15 Apr 1951? Here’s a quick list of all the fun birthday facts about April 15, 1951. Celebrities, famous birthdays, historical events, and past life were excluded. Try another birth date of someone you know or try the birthday of these celebrities: September 11, 1921 – Edwin Richfield, English actor and screenwriter (d. 1990); April 29, 1981 – Tom Smith, English singer-songwriter and keyboard player (Editors and Magnus); June 9, 1979 – Ryoko Kuninaka, Japanese actress and singer.